The B-10 and B-12 tractors are powered by smooth, responsive Briggs & Stratton engines built to Allis-Chalmers specifications. In addition to the exclusive dual spring, all range governor control, these engines feature stellite-faced exhaust valves and positive valve rotators that double valve life . . . front and rear shielded ball bearings to withstand severe shock loads on pull, push and PTO work . . . a highly efficient, no-spill oil foam air cleaner . . . a power-saving, low back pressure muffler that lets the engine speak with quiet authority . . . a unique dust-sealed ignition system with powerful ceramic magnets that develops a strong, hot spark even at low RPM . . . plus the Briggs & Stratton "Easy Spin" starting system that improves electric starter performance in cold weather and reduces the starting load on the battery. The engine features a rotating flywheel blower that forces air through the deep cooling fins on the close grained cast iron cylinder head and engine block. The crank shaft is made of heat-treated ductile iron with integral counterweights and camshaft drive gear. Crankshaft rotates on shielded ball bearings. The piston has chrome p1ated rings. Valves are made of forged austenitic steel, stellite faced, and have positive type rotators. Crankcase breather is vented through the "Oil-Foam" air cleaner and filtered through the polyurethane element. A dual spring governor, fully enclosed and running in oil, instantly responds to engine demands for more rpm. The exclusive "Easy Spin Start," high tension magneto system, and the 12-volt starter generator systems, combine their operations which result in the easiest starting engine available. L ubrication of the engine is accomplished with a simple efficient splash system. The muffler is of low back pressure design. 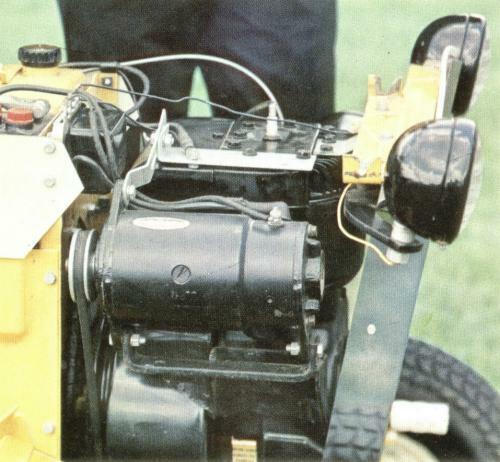 A completely new engine designed for use with the B-12 tractor. Manufacturer's ratings - 12-hp at 3300 rpm; 3-7/16" bore; 3-1/4" stroke; 30.16 cubic inch displacement. The same quality features are utilized in the new 300421 engine plus an exclusive breakthrough in single cylinder engine design. A Synchro-Balanced Crankshaft: Synchro-Balance is the tradename Briggs & Stratton uses for dynamic balancing. This is accomplished by gear driven counterweights on the outer sides of both the engine main bearings. These counterweights rotate opposite the direction of the crankshaft static weights. The result is smooth engine performance with 60% less vertical vibration and 85% less horizontal vibration. An excellent demonstration of this new smoothness is to place a coin on the hood of the Bi12 tractor. Run the engine at full rpm. The coin will dance on units not using the Synchro-Balance engines while only sliding slightly on the new 12-hp engine.